Discovered in 1808 by L.J. Lussac and L.J. Thenard (in Paris) and Sir Humphrey Davy (in London). 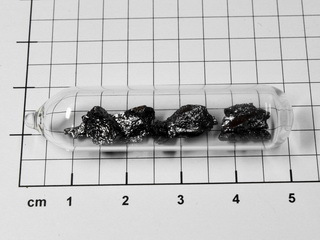 Boron is a non-metallic element which occurs in several allotropes. It is rarely found in nature, normally occurring as borates or orthoboric acid (the abundance of boron in the earth's crust is 10 ppm, the principal ore being borax, Na2B4O7.xH2O). Amorphous boron is the more common allotrope and exists as a dark powder which is unreactive towards water, oxygen, acids and alkalis. Boron finds importance within nuclear reactors due to its neutron absorbing capabilities, boron steel being used as control rod material. Boron compounds are used for a number of applications including the manufacture of certain grades of glass and detergents. Boron will react directly with most metals to produce metal borides which are hard, inert binary compounds of various formulae and arrangements of the boron atoms. For example, as single atoms (M2B), pairs (M3B2), single and double chains (MB, M3B4), sheets (MB2), B6 octahedra (MB6) and B12 clusters (MB12). 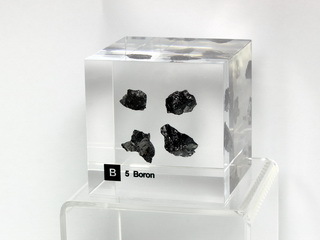 Boron also forms the binary compound, boron nitride, which is of interest as it is isoelectronic with carbon and occurs in two structural modifications; one is a layer structure similar to graphite which is soft and lubricating, whilst the other (formed under high pressure) has a very hard, stable, tetrahedral structure as found in diamond.